COMMUTERS are ignoring Government advice and are using myki cards on trams as well as trains. The Myki scanners on the trams (those that work, anyway; I saw lots yesterday that aren’t) are sitting there like everything’s fully functioning, asking you to touch your card. How about if they said “Testing only” or “Valid for authorised testers only”? How else are people meant to know? Or even notices on the trams that say so? Would that be so hard? MYKI has been in operation for a month and the verdict is to keep using Metcard for as long as you can. The Public Transport Users Association has advised commuters to stick with the old system until all myki’s bugs are ironed out. I know some people are using it and like it. And I think on trains, it’s probably 90% there. But there are enough problems with station gates being slow or unresponsive that it would cause utter chaos if everybody was using it. Not to mention the problems with over-charging, or most seriously, payments through the web site just completely going missing. One of my neighbours summed it up best when he said to me that he paid money in and it just vanished. He rang the call centre. 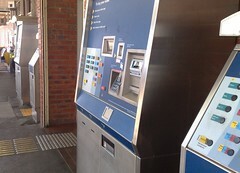 Apart from the system faults, even basic stuff, like putting a Myki machine in every station, hasn’t been done. I was at Frankston station on Monday. One of the busiest suburban stations, it has five Metcard machines, and NO Myki machine. Even if space was a problem, why on earth couldn’t they have taken a single Metcard machine out so there was at least one Myki machine? That page has a long list of problems found in just the first month of operation in Melbourne. Like I’ve said before: Don’t use it unless you’re looking for trouble. And whatever you do, do NOT pay any money into the web site. I’ve been using Myki for 3 weeks. No problems so far. I catch early bird train into town and have not been charged even if train gets in late (past 7am). I just wish it was working on trams/buses. I’ve made top up at machine at Flinders st – no problem. I can look at my journey history over the net or at a station (it even shows my free trips). Well said Daniel. It really still is very, very early days for your average commuter. Re the Gates: I’ve noticed in the last two days that the retrofitted gates I regularly go through at Degraves Subway are now much faster than they were. Same at Glenferrie Station where they now respond almost instantly. One would hope that perhaps they’ve done something to improve the situation but frankly I don’t have that much confidence in them, it’s more likely that it’s really just luck, though others have reported the same improvement on twitter, we shall see I guess. Station pole readers also appear vastly improved. The last couple of days I’ve actually felt a little smug as I’ve just walked through touching on whilst others were fumbling with Metcards. It really is quicker when it’s working properly, at least on trains. Re Trams: I have taken quite a few trams journeys, and where it’s working, it (mostly) works well. But as you note on many trams it’s either off completely or there are some readers not working. Though one person hilariously noted that one W class on Chapel Street had only Myki readers working and not a single metcard validator in operation. What frustrates me about the tram/bus situation is the Robotic response we get from Jean Ker Walsh “It’s not valid on trams and busses”. Yep, we know that. How about a little more communication re the progress of rectifiying the problems? What are they doing to fix it? Are they fixing one reader per night, and that’s why, according to The Age at least, Minister Pakula said they would be working by the end of the year? Are there teams of technicians standing in tram depots in the middle of night scratch their heads Chief Wiggum style muttering “Well, I’m fresh out of ideas”? Is it purely a software only issue, or does the actual hardware need replacing/adjusting/reparing? On some lines it seems like every tram is working fine. The other day I randomly watched trams going down Swanston Street and I could see that about 8/10 had their readers working. I’m hoping the reason they aren’t reprogramming them to say “testing only” or putting up signs telling you NOT to use Myki is that it’ll be sooner rather than later that we can actually use it. It would be much better if they could come to some arrangement where those who wanted to travel using myki were able to do so without fear of getting fined, which just seems overly Draconian. EG Let those with Myki Pass Travel: Let those with Myki Money travel if they’ve already touched on elsewhere or something else (assuming readers on a particular tram aren’t working). But I guess doing something like that would confuse people even more. @condog412 whom I follow on twitter rightly noted that a zone 1+2 metcard is $49.60, and so is a zone 1+2 weekly Myki Pass. How can they really get away with charging us the same amount when we’re only getting about 1/3rd of the value out of the thing? Re the website: yep, it’s a dogs breakfast. Thankfully they seem to have at least acknowledged the situation with this new FAQ that’s been released, so hopefully we’ll see some improvement there, but you are correct, until that’s fixed you shouldn’t let your credit card anywhere near the thing. Re the Call Centre and Staff… well they are all friendly enough and empathise with you. But they don’t appear to have powers to do anything at all much, really. I raised a feedback request through the website re being overcharged for not touching off with Myki Pass. I eventually received a response yesterday apologising for problems with my online topup (I’ve had no such problem!) and that I would be contacted in due course. Looking forward to that. Also, there have been numerous instances of Card Vending Machines crashing in the middle of transactions, of them not accepting EFTPOS. I’ve lost count of the number of “myki fail” tweets I’ve seen on twitter with pictures of crashed myki hardware, but if that’s the reality of the system then I guess they deserve the bad publicity until its rectified. Somehow I think all the issues will be magically fixed not far prior to the State Election. The question is, will it be enough to save them. myki is going to piss off visitors, because you have to pay $10 for a card with no stored value, and you can’t get a refund for remaining stored value when you leave. With London’s Oyster card, you pay a refundable £3 deposit, and you can get any stored value back when you leave. Many buses (the ones that travel to Chaddy at any rate) have Myki scanners instructing “touch your card” type message which has confused a few commuters. I’ve used mine a few times on the trains when that was the only mode I needed, but my usual trip to and from work involves train and bus. I’ve used it on the buses a few times and it has worked about two thirds of the time. I’ve always talked to the driver first to get his agreement with my intention to experiment. I was able to scan on in Yarra Glen on the 685 the other morning, but when we reached Lilydale station the reader had stopped working. There’s only one reader on that bus. However, since I scanned on again at the station straight after getting off the bus, it all worked and my dollars are correct. On the 736 bus from Mitcham it worked on both readers (in at front, out at back door). The driver on the 736 wasn’t confident that it would be working soon. He’s been told March, now June and he still hasn’t had training on the equipment he’ll need to use. Another driver’s opinion was that the hardware simply can’t work properly, so the system is doomed on buses. I’ve noticed both quick and horrendously slow scan on/off behaviour, suggesting that the machines themselves are capable of operating quickly but perhaps the software isn’t written properly to allow them to do it. In any case, these machines need to display a “Reading Card” message while they’re reading your card, instead of continuing to display “Please touch your card” until the moment that they say “Touch On Successful”. Showing absolutely no response during communication will lead to people (like me) taking the card away too soon, thinking it hasn’t worked. I could go on but must stop. Touch off is hard to remember when there are no turnstiles. It’s a big change to the way I’m used to travelling and means that I get to pay a little more for every trip i forget to touch off on. Vas, I agree it would make sense to make the Myki deposit cost refundable (provided they can establish you didn’t get it during a free offer period), but I don’t have a problem with the pricing of short term tickets. It’s the same as single Metcards, which plenty of tourists (and others) buy now. And let’s face it, $6.80 is a pretty good price for a day’s worth of travel around the CBD and inner suburbs — less than you’d pay for unlimited travel in a lot of other cities. Terri, legally you risk a fine. That said, I think its unlikely a valid myki (on trains) would ever get to the stage of a fine being issued. The gov’t had to rush through some last minute changes. Even if you had the pamphlet, tram inspectors wouldn’t use the mobile readers to be able to check the myki has been touched on. Getting off the train one afternoon, the line going through the only gate of the local station suddenly stopped. We didn’t know why, and had a look forward. ONE person was touching off their Myki. Easy solution – have them switched off and perform testing during the quiet times. The number of people who queue up at the front door to scan their METCARD is getting a little silly. Best have them switched off (and besides, do we really need almost an entire year of testing?). I will start using myki when it improves. Hah ! Melbourne system wins. NSW Government has just restructured public transport fares to something which looks almost like a copy of Melbourne. Or it is just a scam to drastically reduce fares in some outer marginal electorates ? 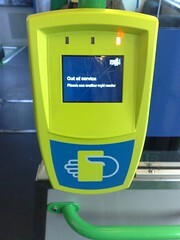 Standyby for a clone of myki as soon as you get the bugs sorted out. WTF enno? No they haven’t. The TravelPass zones have always been somewhat similar to Melbourne zones: http://www.cityrail.info/tickets/commuter/travelpass – that’s been in place for years, but the tickets only come in weekly, quarterly and yearly varieties. They started implementing a smart card system similar to myki, but when it became seriously late and over budget they canned it, figuring it was better to cut their losses while they could. After that experience, it would be hard to get public support for a new smart card ticketing system. I’ve done a separate post on Sydney’s new fare system. Someone has tweetered about a colleague of their’s being fined $170 for using a valid myki card on a tram- , supposedly they also had a ticket. Daniel – you owe me $160,000. I have ordered a myki card while it is free, but on your/PTUA’s advice I have not linked it to my bank/credit card. Had I done so, I might be $160,000 richer, like this guy! I bought a MyKi, and went to top it up on the website. 24 hours to take effect, it said right there, and I thought that was probably the worst case. In any case, there’s no excuse for that sort of delay in a new system. It should have been designed from the ground up for instant updating. In any case, after 12 DAYS, and still no change to my balance (the transaction shows on the website, but the balance hasn’t changed), I emailed the MyKi customer service centre. “Please allow 7 days for a reply”. WTF? They have blue-shirted drones underfoot in every city station, but they can’t hire some people in the support centre? Or a decent systems architect, for that matter? When I did get a reply, they said my balance would be updated within 48 hours. Why the freakin’ delay now? Needless to say, 5 days later, I’m still waiting. And we paid how much for this vile crap? Damn! I agree about internet top ups not working and the customer service centre being useless. My first top up took 5 days to appear on the Myki card (despite being from a debit card that registered the transaction immediately). The second was from a Visa card and still hasn’t appeared on Myki 15 days later. It appeared in my Visa transactions within 2 days – ie they have my money but I don’t have the service I paid for! Basically I am back to using a Metcard. I have complained to the PT Ombudsman (who also seems to be inundated with complaints) that the current service contravenes the EFT Code of Conduct. If they spent some of the money they are spending on PR on fixing the system instead we might get somewhere!